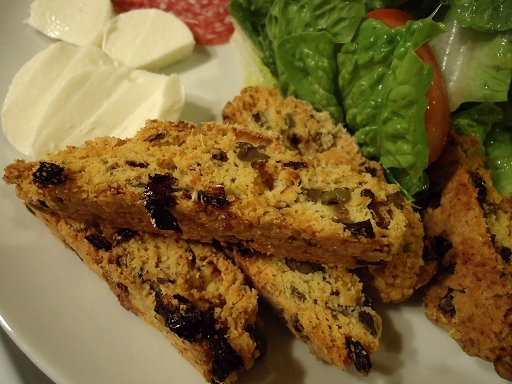 I'd never made biscotti before, but it turns out it's quite easy. Mix ingredients, shape into log, bake, slice and bake again. Done! And not a rolling pin in sight! So, cooking them was easy, and the taste was... Look, if you eat one of these on its own, it's a great punch of flavour: slightly sweet from the sugar, and then tonnes of salty savouriness from the sundried tomatoes, olives and parmesan. If you have one on its own, you're like, "Yes please. Thank you very much. Yum yum yum. Maybe one more for the road." If you (I mean me; I can't speak for you personally) eat more than, say, two, you will begin to feel a bit sick. I am not great with the greasy taste of cooked cheese, or with sweet and savoury together, which meant that I got overwhelmed when I ate too many of these. Basically, I only managed four of the biscotti in this photo, because I had to stop due to imminent nausea. But, you know, with the caveat of requiring strict portion control, these are a great little snack. Yep. You read it right. 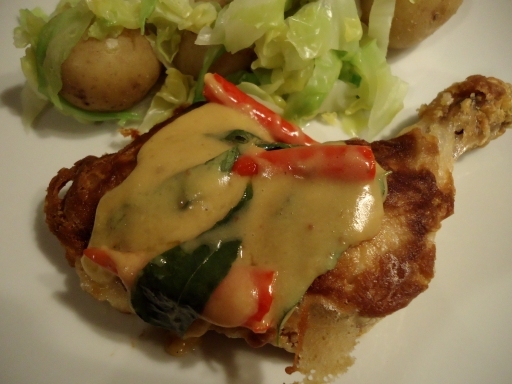 That's fried chicken topped with a sauce made out of butter (and evaporated milk)! As per usual with my chicken legs, I didn't deep-fry them as I was meant to, but instead shallow-fried them and then put them in the oven. I also had to change up the batter for the chicken, because the recipe calls for tapioca flour and wheat starch, among other things. Tapioca flour and wheat starch are complete strangers to my supermarket, so I substituted with cornflour and plain flour. The sauce contains curry leaves in with the butter and five (five!) whole bird's eye chillies. It was a hot sauce! I'm really excited, though, to have been able to purchase proper curry leaves. I've never been able to find them before and have always had to make do with kaffir lime leaves instead. Let me tell you; the two are not identical! I would put the lime leaves down as being citrussy, while the curry leaves have a more savoury taste (they remind me, oddly, of bacon-flavoured crisps). Turns out I love the taste of curry leaves to pieces. 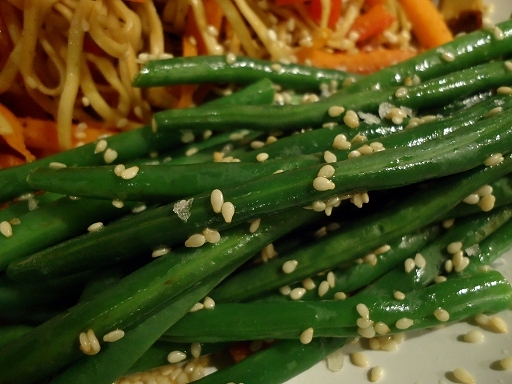 As a result, this was a tasty tasty dish (I couldn't bring myself to eat the chillies though; it was hot enough as it was). This burger was massively tall. It was almost impossible to fit it all in one photograph, which is why the angle in this photo is so weird. 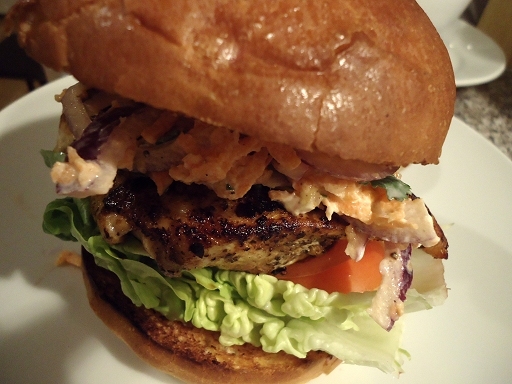 The burger tasted good, what with the chicken, and that great coleslaw, and the brioche bun. I have a bone to pick with the recipe, though, which told me that my chicken breast would be cooked through after five minutes on each side (lies!) The extra chicken cooking time meant that it got burnt on the outside a little, which actually added a nice smoky flavour to the burger. Woo! 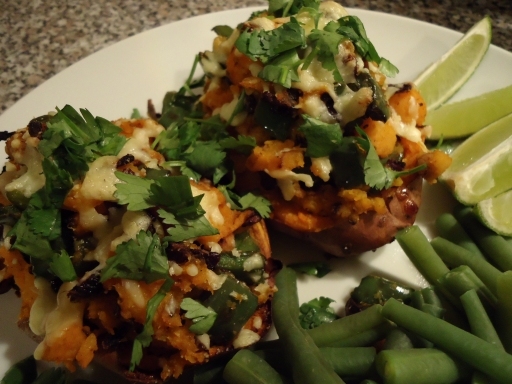 This recipe is so on-trend with those sweet potatoes. The only thing it needs to bring it truly into 2019 is to be vegan (use vegan cheese and replace the chicken with tofu perhaps? idk. I won't personally be trying a vegan version when there's a chicken option out there.) Now, I have even an even bigger bone to pick with this recipe than I had with the last one. The cooking time for the sweet potato was waaay out. I don't normally bake potatoes in the oven and I'm not used to cooking sweet potatoes at all, so I have no idea if the recipe was wrong or if my sweet potatoes were super huge mutants (but, to be fair, the recipe does call for large sweet potatoes). Basically, my sweet potato was nowhere near cooked after only 30 minutes (it was, instead,a big, hard, orange brick) and it needed at least 45 minutes to an hour in total to turn soft. Do you know how disappointing it is to discover that you will have to wait an extra 30 minutes for dinner when you're already hungry? (Very. Is the answer. Very.) Once that was all sorted out, though, the end result was good. The taste verged on being too sweet for me (I'm not a fan of sweet potatoes for that very reason) but the combination of the cheese, fajita-seasoned chicken, and lots of lime juice, really helped to make the sweetness bearable.